A cottage is a small stand-alone house, a pre-modern type originally built in Britain for farmworkers--cotters. They were simple dwellings built low to the ground with a pitched roof. If roof was steep enough there were sleeping rooms tucked into attic and dormers. 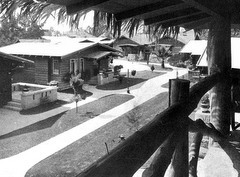 Cottages were built from local materials, and entirely handmade. Often located in picturesque rural settings, cottages were appealing features in the landscape. Interiors were comfortable and spare, never pretentious. 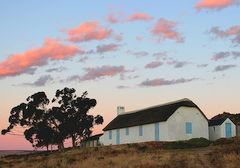 These characteristics persisted as cottages evolved from agrarian to vacation use, and could suggest further development today. 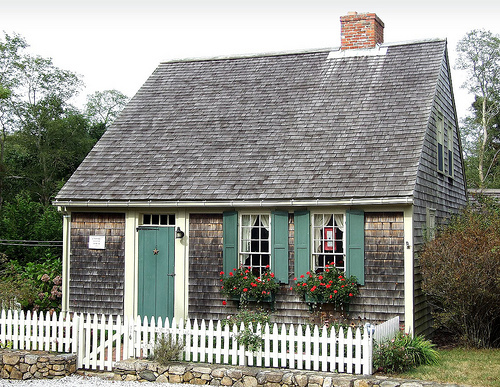 Cottages of colonial New England were well adapted for local conditions. Early settlers built them to gain a foothold on the land once the frontier was relatively safe. In response to windy conditions on Cape Cod and other coastal areas and bitter cold winters they built tight shipshape cottages set low to the ground with a massive central chimney to preserve heat and anchor them to the ground. Houses like the Knowles Doane (1765) were called "half Capes," anticipating an addition that would double its size and complete symmetry of design. Capes had a simple rectangular footprint with wood sill beams resting on the earth. There were no overhangs or projections to catch the wind. A door yard with picket fence kept blowing sand from mounding up against the building. During the winter months a small Cape could even be slid over snow and frozen rivers to a more desirable location. The 1890 Census revealed for the first time that American settlement spanned the continent, and the frontier had been effectively broken up. What seemed an endless wild territory had been conquered. This worried some in the East, including historian Frederick Jackson Turner. He argued that Americans' source of vitality, innovation and strength was manifest in their confrontation with the wilderness. Emigrants of the old country were transformed into Americans by having to cope with the savagery of the frontier. They became more resourceful, self reliant, and less class-conscious as a result. While the border between settlement and wilderness continued to shift westward through the 19th century, an essential tension held until about 1890. Turner warned Americans that without a similar challenge the closing of the frontier could mark the beginning of the young nation's decline. Nineteenth century immigrants believed owning land to cultivate and building a home were almost assured. The 1862 Homestead Act offered unclaimed land in the West to anyone willing to farm it. From colonial times to the present Americans expect to maintain authority over their own private property, and bristle at all regulations. The attitude is critical to their sense of autonomy and self-determination. Once the American frontier was closed the perception of wilderness shifted from lands to conquer to places of sanctuary. 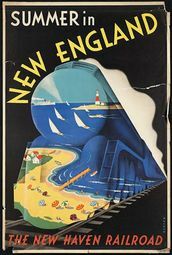 Beginning in the late 19th century well-to-do residents of inland cities escaped hot summers by vacationing in New England's cooler climes. Some bought property there, and renovated or built summer homes. Investment by summer residents revitalized many historic towns that had been bypassed by industrialization. Vacation cottages began to appear in picturesque villages, along lakes, coves and valleys. Light on the land, cottages were designed to fit easily within a natural setting. They disturbed the site as little as possible, nestling into slopes, woods and other features to merge with the land. Evidence of resourceful builders, remote cottages were built with materials close at hand. They show both ingenuity and expedience. Builders sought the most efficient shelter possible with the least material and effort. Purpose and utility drove every decision. Simple and graceful, cottages show clarity of thought. Simple forms and construction reduced effort, but as the Shakers understood, designs pared-down-to-essentials also have a certain grace. A simple cottage is easy to understand, and easy to imagine building. Appealingly human-scaled, remote cottages were built with hand tools alone. Challenges were immediate: "How far can I reach on this ladder? How much can we lift together?" Limitations enforced human scale, and this was apparent in the finished cottage. Improvised and well adapted over time, cottages often had a casual mismatched look that contributed to their charm. Consistency and decorum gave way to a greater sense of harmony—a home in the landscape, and shared memories across generations. Comfortable furnishings, familiar and cozy, were typical for a vacation cottage. Found objects and repurposed discards were also fair game. Nothing had to match, and the rules of good taste did not apply. Cottages were furnished for enjoyment, not to impress others. Respectful of natural setting, a remote cottage was often little more than a shelter in the woods. As Thoreau discovered on Walden Pond, when our attention is focused and uninterrupted we will be more observant and mindful of our impact on a place. Insights gained can be like portals, each one leading to the next. Sheltering and sturdy, remote cottages provided comfort as well as physical shelter in rough weather. Features like a stone foundation, stout chimney and operable shutters all enhance the feeling of protection. Sturdy materials also made cottages more secure when closed-up for the season. Safe harbor. For some people a vacation getaway is a respite from the demands and challenges at home-- a place to recover, reassess and gain perspective. Contrast to everyday life is important here. Most Americans today live in metropolitan areas that are urbanized and highly diverse. While some communities are coherent and pristine, others are a tsunami of sprawl and neglect. The challenge for these places is to reinvent and repair what no longer works. The nation's sprawlscapes could become the new frontier Turner hoped for--places where new arrivals might gain a foothold on the land. Most metro areas in the US have vast resources of poorly utilized land, including abandoned industrial sites, rail yards, parking lots and places overlooked in leapfrog sprawl. Significantly, recovery and development of these lands are out of the hands of individuals and small-scale improvements. They are captive to a planning process that is apparently intended to serve only large scale developers and real estate interests. Prior to the mid-twentieth century small-scale incremental growth, fine-tuned repairs, and corrections occurred naturally in traditional cities, but this rarely happens today. Where might individuals find land to build for their own use today? Check out the backyard! There may be enough room to build a small cottage or accessory building. 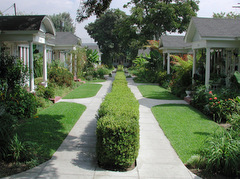 Land use regulations for single family zones have been relaxed to accommodate accessory uses in many communities. There are also likely residual and infill parcels in your area that remain poorly utilized. Small houses and backyard cottages built in desirable single family neighborhoods do not reduce property values, but add diversity of income. Imagine, the number of dwelling units could actually double without tearing down a single house! 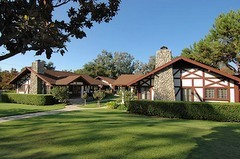 The economic advantage of adding a cottage could also stem McMansion trend, where any house less than 1,500 square feet is considered a "teardown." Backyard cottages could allow singles and couples, both young and old, to live among families. Some people-- your children, for instance-- might like to live in the neighborhood where they grew up, but cannot afford to buy. If land parcels remain "owner occupied," with property owner living in either main house or cottage, responsibility for tenants remains clear. Neighbors know who to contact if there is a problem. Those early vacation houses and studios could be useful models for new cottages. Think of a cottage as a small house with an attitude. It is not only smaller, but more resourceful. It dismisses assumptions of what a house must include, and provokes us to reconsider what is really essential. Anticipate potential growth of cottage so you could later add a room or new wing, and locate the building with this in mind. Multi-use spaces perform double duty. If you can eliminate rooms from the design, you will significantly reduce costs. For instance, if a kitchen dining banquette could replace the "dining room," you would save almost 100 square feet. Add the right features and banquette could double as a library or home office. In a small cottage we suggest each room be given a distinctive character for spatial variety and contrast. Keeping room was the 17th century precedent for today's kitchen-family room--the place where all the action was. 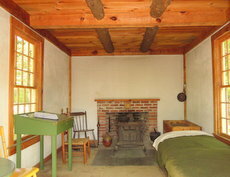 Especially during the winter, most activities took place in the "keeping room" before a huge fireplace and hearth. Fireplace enabled cooking and baking, and kept the household from freezing. Alcoves that open to a multi-use space could be an alternative to separate rooms with isolated uses. Possible alcoves could be a kitchenette, home office, or bedroom. These can be closed to the main space with screens or doors. Design floor plans one room deep to allow for windows on at least two walls, and cross ventilation. Bedrooms, for instance, can be very small if they are given big windows. A long thin floor plan might also turn a corner to define an outdoor space or courtyard. Combine children's bedrooms into a single space with separate bed alcoves. This could significantly reduce the number of rooms and baths needed. Each alcove could have a curtain, bed or bunk, wardrobe, cubbies and a window. For kids it would be like riding an old time train. Whoo whoo--here comes the night train! Compartmentalized baths can be used by more than one person at a time, and could reduce the total number required. We remember B&Bs of our youth usually had a lavatory in the room with a WC and shower down the hall. Yours would likely be connected, but it's the same idea. Build your cottage in a resource-full neighborhood instead of Outer Suburbia. Select a place where you will feel at home. If you can walk or bike to stores, you won't need a ton of storage. If there is a hotel in the neighborhood you won't need a guest room. If there are coffee shops, cafes, libraries and parks you will have places to go if you get cabin fever. You might even meet some nice people--if the Wi-Fi is down. Like living in a boat, you need places to stow everything essential, but we doubt you would set sail with boxes of junk and old magazines you throught you might someday revisit. Make every space count. Built-ins may be best for some storage, while movable furniture better for others. You can see where this is going. Our point is simply that affordability and good fit are linked concepts in planning your cottage, and often enhanced by fresh thinking. We all take satisfaction in creating a home that represents our values and aspirations. Today, our homes are often the only places where we can express personal authority, and assert how things should be. For many reasons home ownership in the US is dwindling, and especially for young people. Many graduate from college with huge debt obligations and few prospects for a decent job. They cannot qualify for mortgages with debt and housing prices well beyond their reach. The good news is that diminished prospects often lead to new ideas and alternatives. Make an end run around the system! Start by discarding "consumer expectations" of what a house must be. In the Land of Plenty re-imagine existing resources, like marginalized buildings, and their untapped potential. Consolidate your team, whether family or friends, and work together to create a home. Invest in places with strong social capital where your financial investment can grow, and sweat equity will pay off. Perhaps building a cottage or group of cottages will be your solution. Think of a cottage as a small house with an attitude. It is not only smaller, but more resourceful. It dismisses assumptions of what a house must be, and provokes us to rethink what is essential. Build your cottage in a resource-full neighborhood instead of outer suburbia. Pick a place where you will feel at home. 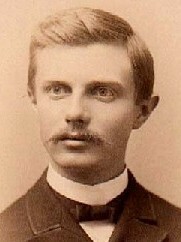 Frederick Jackson Turner, 1890, was clearly too young to be fretting over the good old days. Dixon-Hamlin bunkhouse for the boys was an extension of earlier log cabin. 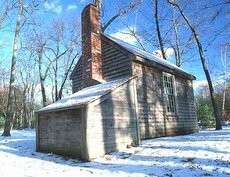 Typical cottage of Colonial Williamsburg had a small footprint. Sleeping rooms were tucked into attic storey with dormers.